I’ve been meaning to say that although it’s very hot here in Vegas, even from early in the morning, it’s surprising how chilly/cold the water is in the Bellagio Pool!!! Anyway, as usual, we started the day around the pool. True to human form, we are sitting in the same place around the pool each day. Si goes down about 9 a.m. to get us a shady spot, that way we can stay out longer. It’s brave souls who can lie out in that hot sun for any length of time! We’ve had some lovely photographs taken by a professional photographer. We were having dinner at Sensi the other evening and she came round and asked if we wanted our photographs taken. 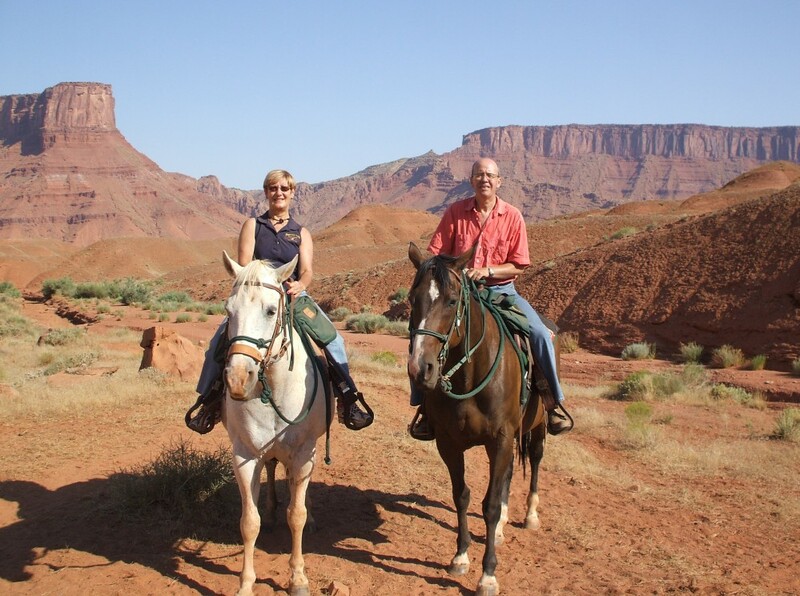 As it’s always difficult to get any decent photos of the two of us when we are on holiday we decided it would be a good idea. One other piece of news! You remember I said that we had progressed up the reward card ladder after just a couple of days? Well, we have progressed again, we are now at Gold level. One of the perks is that we can go straight to the head of any queue for food!! Hooray! We also get 20% off purchases ……….. what a shame the suitcases are already full up!! 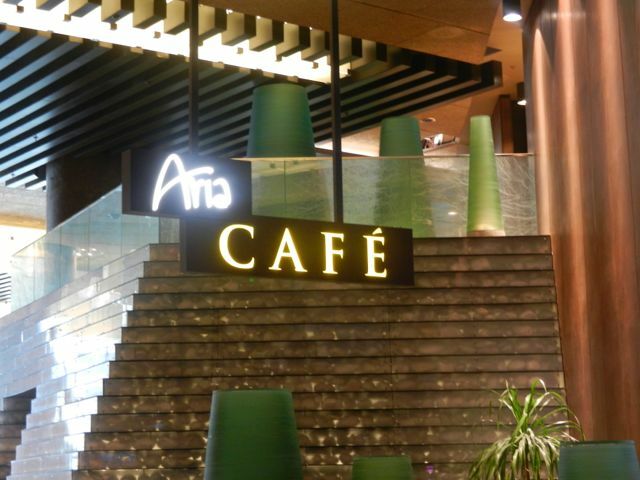 We had lunch at a new venue today, the Aria Cafe at the Aria Hotel. As usual, here’s a photo of Si enjoying his eats. We have decided which show to go and see. There’s a new Cirque du Soleil in town, Zarkana, so we will be going to see that tomorrow evening. 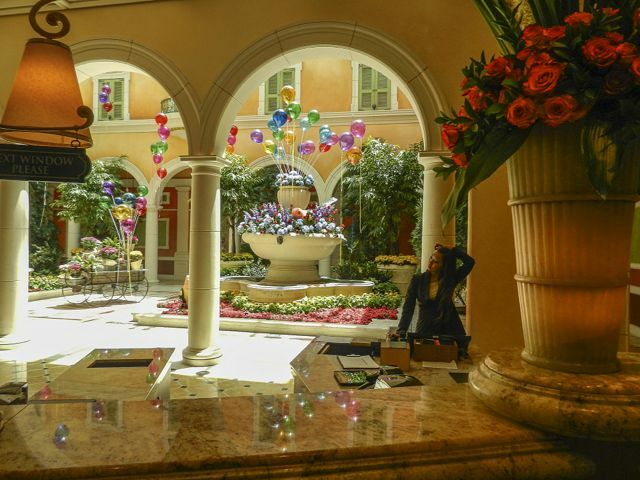 Here are some more photos of the Bellagio Reception and Atrium and an interesting sight on the Las Vegas Strip, Las Vegas showgirls. Thanks Ann. The time passes very quickly, only two full days left! Love your little icons. 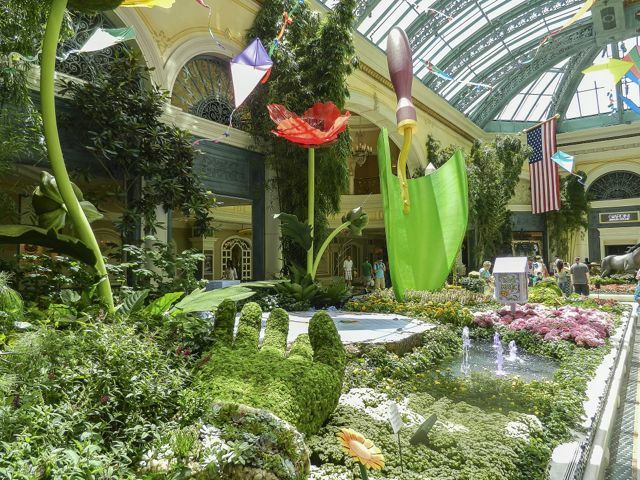 How do you like the Aria hotel compared to Bellagio? I think my sister and I are going to plan a long weekend there in October! The photos are amazing! Send some of that sun and hot weather our way here in PA! It’s been rain, rain, and misty all week!! Thanks Nat. 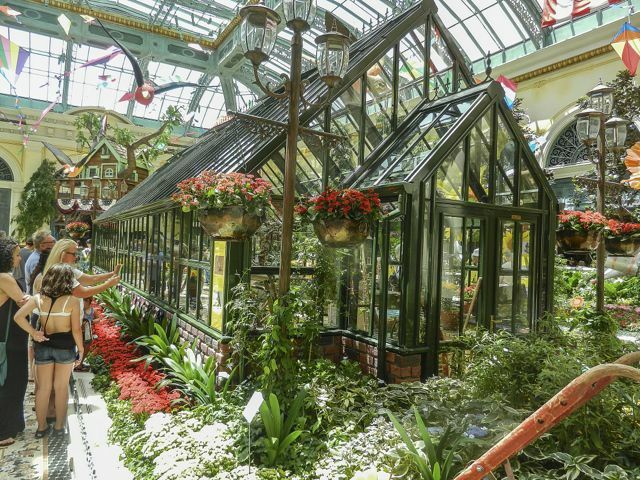 In my personal opinion nothing beats the Bellagio, we usually stay in the Spa Tower. We’ve only visited Aria, never stayed there so I don’t know what the rooms are like. 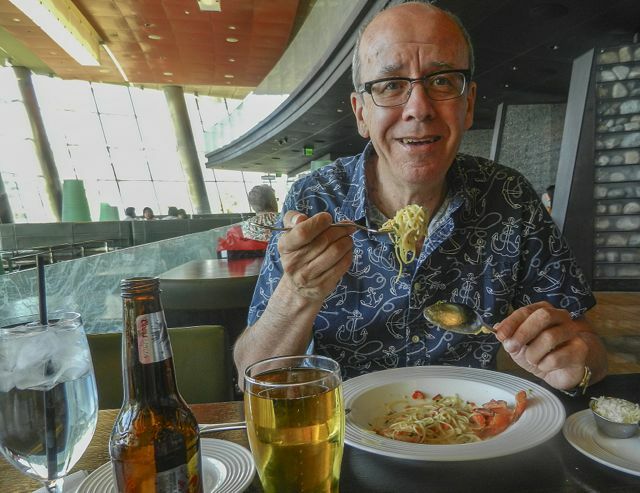 We stayed for a couple of days at the Vdara at the start of our hols and they are all suites so the room was nice but they don’t have a restaurant, only snack places, you have to go over to the Aria to eat, but it’s a non-gambling hotel so some folk like that about it. Packaging some sun and heat as we speak and will FedEx it over!! LOL.